Amid massive technological and social change, doctors around the globe are finding themselves in unfamiliar territory. McCann Health's "Truth About Doctors" study uncovers what this means for pharma marketers and how the industry can help physicians future-proof their profession. "As disruption besets the healthcare landscape, the pharmaceutical industry must embrace a similar level of disruption and radically rethink its engagement with doctors around the world," said John Cahill, global CEO of McCann Health. 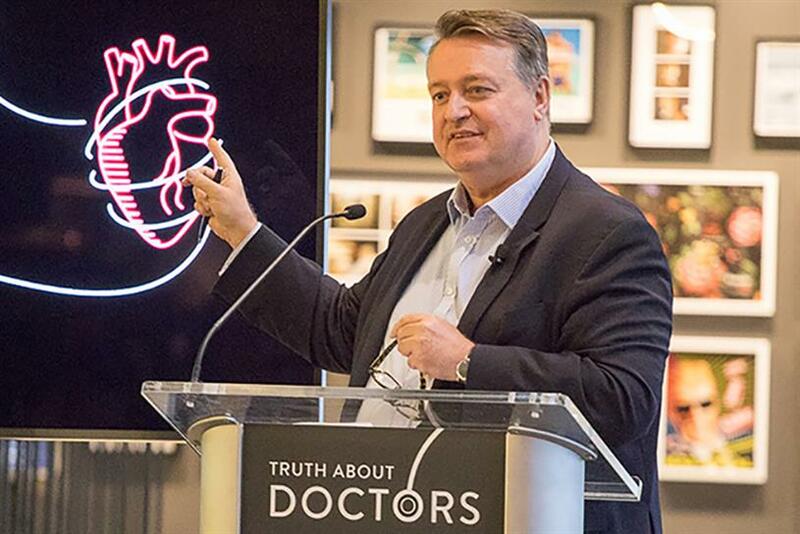 "Doubling down on our humanness will be the magic in how we drive better outcomes," he said to an audience of nearly 100 pharma marketers who gathered on April 25 to hear results of a new "Truth About Doctors" global study, jointly conducted by McCann Health and McCann Truth Central, two units of the global McCann Worldgroup marketing services firm. McCann Health's landmark global study, which entailed interviews with nearly 2,000 doctors in 16 markets* found that the practice of medicine is not everything doctors thought it would be. In fact, the expectations of the job are startlingly mismatched to the realities of the high-volume, cost-cutting, technology-driven health environment we live in today. There is a massive gap between expectations and reality for doctors around the globe. 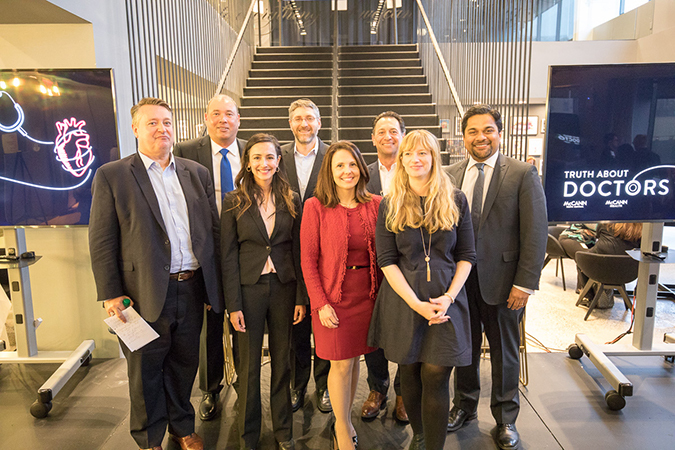 Amar Urhekar, president, McCann Health Americas, who hosted the New York City event, stated, "Doctorness as we've always known it is poised for profound change. Our study sheds light on a blindingly different world than that of even five years ago, but also presents new and powerful opportunities for our industry to engage with HCPs, patients, and other stakeholders in the health ecosystem." In her opening statement, Hilary Gentile, chief strategy officer, McCann Health North America and a co-author of the study, explained: "Medicine has changed from a caring business to a business of care. We learned that 82 percent of doctors around the world see 'providing care' as the their primary role in society. Yet, these same doctors also told us that they feel stripped of their ability to care by the commercial system." And as doctors the world over report feeling a loss of power, it's no surprise that "frustration" was one of the top words listed in relation to the profession. That shows itself in doctors' personal lives: 66 percent reported trouble sleeping, while 58 percent have marital problems. Doctors once had time to develop a relationship with a patient, but that's been hijacked—either by an overwhelming volume of patients, as in India and China, or simply by the mountain of paperwork experienced in the US. It's a far cry from the respect the profession once enjoyed. As one German doctor put it, "We were gods in white." In the words of a Chinese doctor, "We were masters in the apricot grove." Compare that to today's China, where disgruntled relatives are known to physically attack doctors for failing to care for a family member. Gentile added, "As an industry, we have an opportunity to leverage the vast capabilities of population data, technology and artificial intelligence to support doctors in diagnostic efficiency and patient management to win back time. If we first master the system, we will empower the doctor to reclaim mastery in patient care." Gentile co-presented the "Truth About Doctors" study findings to nearly 100 pharma marketers at the April 25 event. And then there's the matter of humans vs. robots—and the fear the latter might win. Laura Simpson, global director, McCann Truth Central, and also a study author, offers, "The expectations of today's world has created the desire for two mutually exclusive qualities from doctors—the human touch and machine-like precision. There is a worry that technology may ultimately push doctors to the brink of extinction. But we believe that advancing knowledge and mega information will never replace the need for a human to understand the broader context of a patient's life—and join up the dots in ways only a doctor can." "There's nothing more personal and intimate than healthcare," added Gentile. "When you're wearing that hospital gown that never closes in the back, you feel very vulnerable. You don't want a robot to hold your hand, you want someone who can empathize." Humor and creativity are other factors that can keep doctors ahead. Gentile breaks down four qualities that characterize the doctor's role: Empathizing, listening, observing, and being there. "Can humanoids do humor?" she asks. "Can robots reassure or help patients make choices?" Cahill accentuated the value of empathy. "We should ask if we're being empathetic in the ways we interact with doctors—with our representatives, our materials, and our programs," he said. "Empathy and gratitude have a very unusual relationship—and I absolutely believe in gratitude. If we can look at empathy in a new light with the work we do with doctors, that will help us better navigate this new system." Clearly, doctors feel they've been taken off-guard by societal changes, such as the ever-present economic discussion and the disruptive tech that has driven myriad innovations in healthcare. As part of his address during the event, Cahill referenced technology's "relentless march." His focus quickly turned to how doctors can remain empowered—and not marginalized—by such advancements. "[Technology is] definitely going to take on a more significant role in the future," he explained. "Instead of looking at data as a policing of the system, we should see it as an enabler of the system—as a way to help doctors become more effective in their diagnosis and management." Cahill also considers "elongated primary care" a plus for doctors. "Shared care is coming into its own," he said. "Pharmacy and nurse educators have been underutilized health resources worldwide. [We must] create a continuum so the doctor is part of the system and not left behind." Along similar lines, Cahill predicted in an interview following his remarks that those in the medical field will hear more about concepts such as "optimizing" clinical expertise to fit the complexity of a problem—say, by having patients get their blood pressure checked in a pharmacy rather than in a formal medical setting. He also mentioned "distributed healthcare," in which care services, such as monitoring vitals and diagnostic checks, move closer to the patient (think house calls instead of hospital visits). In sum, doctors will need to adapt to a new type of medicine. That was also the thrust of a keynote by Dr. Mickey Chopra, lead health specialist at The World Bank, who offered his views on the physician's evolving reality, gleaned from a career that has taken him to the slums of South Africa, where he developed simple protocols that dramatically reduced infant mortality, to UNICEF, where, as chief of health, his efforts have helped eradicate polio. "If you're really going to change the world," he suggested, "you have to know money and politics, [as well as] how to use banks' financing instruments in a way that fits the healthcare trajectories that countries want to go in, and gives the poorest of the poor a safer world to live in." Gentile and Simpson expressed hope the survey will help doctors "future-proof" their profession. "Patients want care. They also want to be fixed," explained Gentile. "It's that blend of empathy and intellect. So we can look at these challenges as an opportunity: Humanize technology to advance care and focus on the relationship, not just the stakeholders." They also see an opportunity for doctors to share the burden of care. "Since doctors are no longer the primary lynchpin, they need to share responsibility with healthcare extenders, such as nurses and pharmacists," added Simpson. "We must help doctors to gain back control of what matters most." And with all the information available, doctors can provide a valued role by helping patients apply their knowledge, instead of being the sole owner of that knowledge. 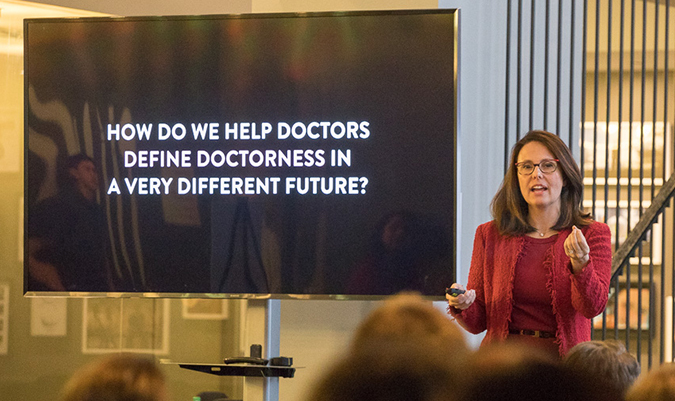 "How do we help doctors define 'doctorness' in the future?" asked Gentile. "We're postulating that the definition of doctor will shift from lifeline to life coach; from health director to wellness partner; from knowledge owner to knowledge translator; and from siloed specialist to holistics expert." Helping doctors succeed now and into the future was the central focus of a panel discussion that followed Gentile and Simpson's presentation. Participants were Kaya Pai Panandiker, VP, Lundbeck, U.S.; Dr. Jose Quesada, chief medical officer, global health benefits, international markets, Cigna; and Markus Saba, senior marketing director, global diabetes brands, Eli Lilly and Company. "Technology can help patients manage their own health and help doctors make better decisions," said Quesada, responding to a question about how data can support rather than supplant clinicians' influence over patients' healthcare journey and behavior. "But the emotional component to the relationship is also very important." "Healthcare marketers have an opportunity to leverage technology in a way that provides ongoing support and continuity for patients that are not in the office," suggested Panandiker. "[We] can play the role of coach to help patients on their journey, when the physician just can't be there." In terms of changing with the times, Saba spoke of young doctors who are digital natives and used to living that way. "Most doctors in America are over 55, and the younger ones ask, 'Why do you guys always have to meet face to face?' Sales reps need to find different ways of reaching out to doctors—say, through apps or virtual reps."
"The new generation of doctors will help us to change," Quesada concluded. *These markets include the US, UK, France, Italy, Spain, Germany, Denmark, Sweden, United Arab Emirates, Saudi Arabia, India, Philippines, China, Japan, South Korea, and Brazil.